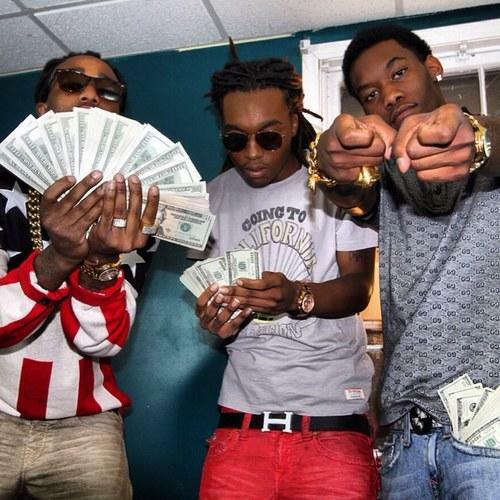 Migos is a rap group made up of a trio of artists from Atlanta: Quavo, Takeoff, and Offset. The group is best known for their hit single “Versace” that was so popular that Drake hopped on the track for the official remix. Migos has released six mixtapes since forming in 2011. The group has collaborated with notable artists including R. Kelly, Gucci Mane, Riff Raff, A$AP Ferg, Wiz Khalifa, Travis Scott, Busta Rhymes, Soulja Boy, Juicy J, and French Montana among others. Though only active for a few years, the young, rising group has gained much attention from its’ big-time collaborations and positive reviews from critics. In December 2013, Chief Keef took to twitter to call out Migos for what he called “sneak dissin’”. The trio brushed off the Chicago rappers’ tweet, and one month later announced the release date for their upcoming compilation project ‘Solid Foundation’. The tape will be hosted by DJ Drama and will drop February 2nd. They released a video for their hit song “Versace”, and despite rumors that Drake would be featured in the video, he was not. Offset was in jail for eight months until his release in October 2013. Quavo is Takeoff’s uncle and Offset is Quavo’s cousin. They have their own clothing brand, Migos Brand. “Versace” probably flows better than “Migos Brand”. They met Drake at the Hot 107.9 Birthday Bash, and Drake began reciting tracks from their tape, after which he hopped on the “Versace” remix. Why Does Everyone Think Lil Uzi Vert Is The Devil?